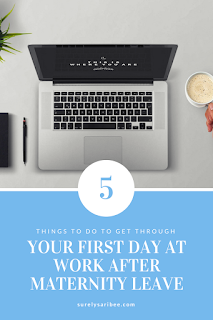 No matter the conflicting cocktail of postpartum emotions you’re experiencing upon your return back to work, undoubtedly, you’re probably wondering how you’re going to handle being a mom and your job. I learned that the first few weeks and months have to be taken one day at a time. Don’t focus on the week ahead, or the months ahead. Each day as a new working mom is a victory. That first day might be the hardest for you. It might not. But here’s some of my tried and true tips to getting over that first mountain of a day. 1. Enlist the help of a distraction. Before your first day, ask your mom, sister or close friend to be available to talk on the phone after you drop your baby off. Make one rule: you can talk about anything but the baby. On my first day back, I talked on the phone with my mom for my 25 minute commute. It was the first conversation in seven weeks that didn’t revolve around our favorite topic: her grandson! She was a distraction from the sadness I felt. If I hadn’t talked with her, I probably would have just cried the whole way to work. Miraculously, I made it through my first day without crying. 2. Pack for yourself like the apocalypse is coming. Of course, everyone will tell you to pack your bags the night before and such, but equally important is to pack the right things. If you’re pumping, bring an extra shirt, a hand towel and lysol wipes just in case of milk leaks, spills and accidents. Pack an insane amount of snacks because without attending to the needs of your baby constantly, you’ll realize how hangry you are all the time. 3. Line out your expectations for the first week with your childcare provider. It’s ok to be a helicopter parent for a while and ask that they let you know when your baby ate and napped and what consistency their poops were. It’s perfectly reasonable to ask for text updates or pictures or call them on your lunch break. 4. Lower your expectations for your baby. It can take weeks and months for your baby to adjust to a new schedule and a new set of care providers. It doesn’t mean anything is wrong necessarily. With my son, he had three different childcare providers in his first six months of life. We started with his current daycare in November and it took until mid-February when he was eight months old for him to really be on a consistent routine. Now he tries to flail out of my arms in the morning into the arms of his fun daycare buddy. 5. Lower your expectations for yourself. Meet your job description, don’t try to excel quite yet. Feed and clothe and cuddle and bathe your baby. Feed and clothe and bathe yourself. Everything else can wait. Crock pot meals and frozen can and need to be your new normal for a while. The fridge can get cleaned out eventually by whichever parent is less sleep-deprived. I promise you the dirty bathroom and the clutter in the kitchen isn’t as important as you think right now.